Not so long ago I joined the IAMTW (The International Association of Media Tie-In Writers). From their website: "We write science fiction, westerns, mysteries, romance and thrillers and sometimes all of the above. Our work embraces just about every genre you can think of, from STAR TREK to CSI, from GUNSMOKE to MURDER SHE WROTE, from DUNE to James Bond, from RESIDENT EVIL to Lizzie McGuire...Our books are original tie-in novels, comic books and short stories based on existing characters from movies, TV series, books, games, and cartoons... or they are novelizations (books based on screenplays for movies and TV shows)." Publishing a novel set within a shared world (Eberron) qualified me for membership. The real purpose of the association is to proudly state what we are: writers of tie-in fiction. See, literature based on movies, TV shows, comic books, or other existing "tie-in" works usually don't get a lot of respectability...at least not in the larger world of books, or even just fiction. 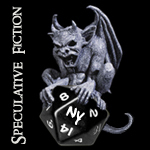 Now, perhaps less than a year later, I've just learned that my first novel, The Darkwood Mask, was nominated for a Scribe Award in the category of Special Gaming Scribe - Best Adapted (I didn't even know that was a category!). Last year the winner was Night of the Long Shadows, by Paul Crilley, book #2 in the same stand-alone series as mine. How cool would it be for another Inquisitives book to take the win? That said, I'm up against a DragonLance novel, another Eberron book (Don Bassingthwaite's...yikes! ), and a Warhammer book. It'll be a few months before the winners are declared. For just a few minutes of peace, a short-lived respite from a lot of chaos going on around me (including numerous hospital visits for multiple people), Marisa and her mother and I drove up to visit some monasteries in upstate New York the other day. (It was her idea, but I quickly warmed to the idea. Plus, I'm always looking for sources of inspiration.) Some are appropriately humble affairs, old priories of mortar and stone that house a relatively small community of brothers. (Or sisters, as there were numerous convents in the same area.) 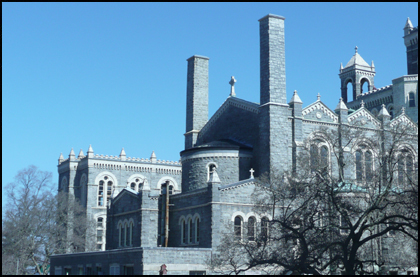 Others are European-style goliaths like the Mount St. Alphonsus Monastery (seen above). The monastic life sure does have its appeal. Peace and quiet seems the most obvious advantage, but for some, a chance for spiritual reflection. For those unwilling to devote their lives to such...quiet pursuits, a lot of these monasteries offer day-, weekend-, or week-long retreats. It strikes me more and more with each passing year how often I stand in the middle between opposing ethics, political points of view, religious beliefs, personal relationships, and even artistic opinions. It continues to surprise me (I don't know why) just how sharply to one end of a spectrum people cleave. I know and love people who are strictly Republican, but am usually surrounded by Democratic types. I know some people who don't care for loud/heavy/hard music, and others who need their music to be loud/heavy/hard for it be interesting. The gaming industry I often interact with seems populated mostly with atheists who rail against "organized religion" and scoff at most talk of spirituality or, at best, just don't care at all. Yet I've got a few friends in my life who do believe in God and can say "Jesus" many times on a daily basis and without taking His name in vain to do so. I've got some friends who love video games and really value the enjoyment and stress-relief they bring, yet I usually spend time with people who dislike them altogether and see in them only a waste of time that could be spent more productively. And this is merely scraping the surface. Everywhere I look there are extremes. To them I am always at arm's length because I can't be the same way. And extreme views only get along with other extreme views. Politically, I'm neutral. My opinion will just go wherever it is swayed (if it is swayed at all). I love pulse-pounding loud rock music, but I also love slower, moody songs and ambient melodies that would put some people to sleep. I really enjoy playing video games, but I don't think I could indulge too much in them without feeling guilty for having done it. I haven't owned a console game system since Atari. When I talk to that other end of the spectrum, the people who dislike the notion of a higher power having any authority over them, I come across as some religious prude. Because I don't curse? Because I never smoke, drank, or touched a drug? Because I never partied? Being in the middle of the road is an interesting place. It's not about not committing to one side or the other. Only when you're standing on the wall can you really see both sides. Who's the weird one in all of this? Maybe me, after all. Maybe seeing two sides of a story is the anamoly. Incidentally, did you know that some monks have blogs? How cool is that? Everyone who knew this big brown dog felt great affection for him. 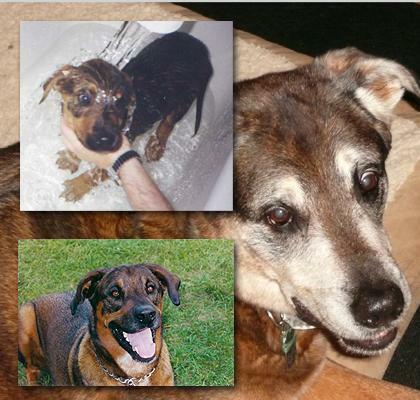 He was a mutt: part Rottweiler, part Rhodesian Ridgeback, part friendly monster. He was a 130-pounder, strong and puppy-like, and not long ago he reached his 12th birthday. He also belonged to my longtime friend, Kate. Just another pooch who embodied the Man's Best Friend epithet that dogs rightfully deserve. I love dogs. Most of them are pure concentrated happiness miraculously crammed into small and furry canine forms. You can't look at, say, a golden retriever with a tennis ball in his mouth and claim otherwise. Or a mutt like Bandit with a chewed up frisbee or decapitated stuffed animal toy. Dogs represent the good side of humanity; they're an appropriate companion for our race on this crazy, often morally-floundering planet. They keep us grounded. They love unconditionally, even when we don't. Bandit will be missed. In my brief encounter with him when he was still a puppy his body couldn't quite contain the amount of energy God had managed to pack into it; he just wanted to jump up on, slobber, paw at...whatever! He just wanted to interact with people, even if he didn't know how yet. Very social, and more than a little crazy. In time, he would become a member of our gaming group. He was our 3rd Edition druid's animal companion. Ever present and warm. Like a power generator, only generating life and love and comedy. He was inescapably there at all times. And as Ruth Lampi of The Five Wits says, "He was the proud scale-appropriate model of a riding dog, as well as the embodiment of the spell Wall of Dog." His presence made our gaming sessions much more memorable...and that's putting it mildly. We loved him, even in later years when he got a little too grumpy and unpredictable to cuddle with. Now he's doubtlessly sprinting through some Elysium fields after celestial squirrels he'd never harm, fleeing from rain, and chomping on whatever suits him. The world is his Bandit Bed. A couple years ago my brother (one of two of Bandit's best friends) recorded a song about him, "His Name Is Bandit", which cites some of the most notable moments, and quirks, from his life. If you've never heard it, give it at least one listen, will you? For him. I think there's going to be a lot to talk about this month. I intend to start talking about this whole novel-writing project of mine, and such. But let's start with one thing at a time. This one involved me directly (rather than just someone I know) and the whole "fantasy and writing" thing that I do. It's an experimental concept album of rich, layered music (about an hour's worth). It's part fairy tale, part brainstorm, and entirely fantasy. Josh wrote and recorded all the music independent of all the lyrics, which I wrote. All I had to go on were the track titles, of which there are four. The end result is a bizarrely pleasant amalgam of music, storytelling, and mood, which I can only hope could be described as a "richly awful tapestry of fantasy." I would be so honored to be involved in such an assessment. So go listen, if you've got an hour. It's got giants, rocks, wraiths, and subterranean things. Music and fantasy need to get together more often, that's all I'm saying. Oh, and tons of instruments were involved. Josh plays, among other things, an animal hide drum, a toy cymbal, an ocarina, a wooden Jacob's Ladder, and hands, feet, and fingernails. And of course vocal chords. Bit of trivia: The Whisper Troop, which the album is named after, will get a cameo in the aforementioned novel. The story that this album tells, however, is merely one of the Troop's many tales. They are musicians and performers within my setting, a traveling band of eccentric players.